I know of two things that many children particularly love! The first is humour, what child doesn’t enjoy laughing and making others laugh? The second … magic tricks! 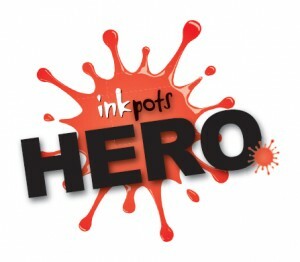 SO many children enjoy performing, wowing and impressing with tricks that seem impossible. 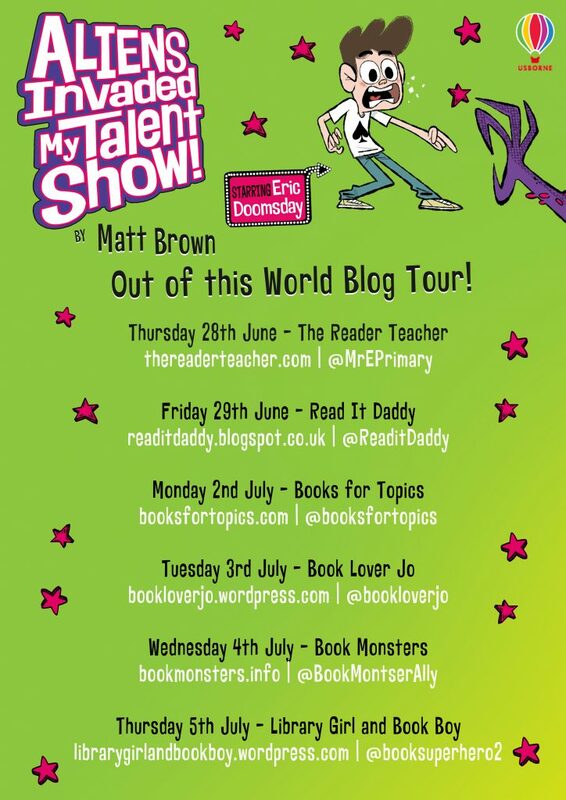 Welcome to my stop on the blog tour for Aliens Invaded my Talent Show, written by Matt Brown, illustrated by Paco Sordo and published by Usborne, this story has both of these key ingredients for a fantastic read. Eric Doomsday loves performing magic tricks, and even though his best friend Vinnie Mumbles adores his amazing talent, they don’t seem to ever go to plan. In this hilarious and rather madcap story, Eric is required to perform his tricks in a school talent competition to save the school from apparent closure. But actually, his magic trick act becomes much more crucial when the inspectors turn out to be aliens intent on destroying planet Earth! Poor Eric holds the world in his magic hands, literally! What a fantastic book this is, so packed with humour which will appeal to both adults and children, it’s a fast read purely due to the entertainment value that keeps the pace moving and the reader gripped. I love that this story is utter insanity, really silly, and yet within the plot the magic tricks that Eric does are actually possible and their method explained. 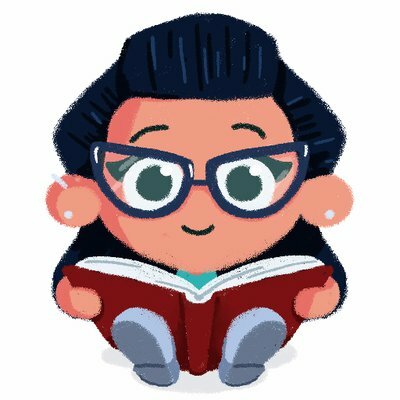 I love the idea of children reading the book and then having a go at some of the tricks themselves. It adds another dimension to an already entertaining book. Paco’s illustrations are scattered throughout the story, not too liberally, so it is a good length and substantial read, but enough to break up the text, add interest and help children visualise the story. The illustrations are bursting with character, and you will laugh at a lot of the expressions. The alien race is, hysterically depicted here. I particularly loved them dressed up in their 80s garb! 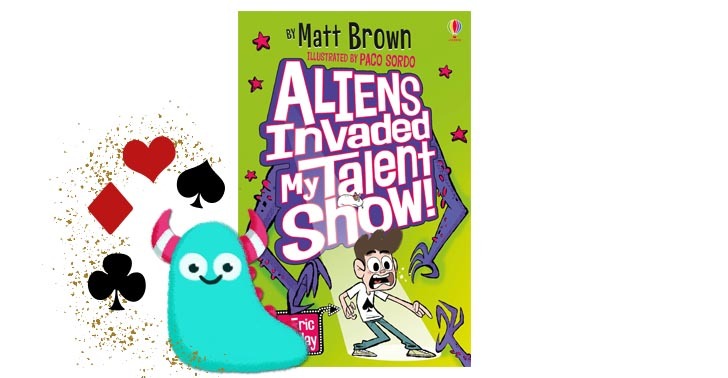 Aliens Invaded my Talent Show is the perfect blend of humour, interest, silliness, action and excitement, with two main characters who are plucky and fun and situations that most children can relate to. Matt Brown and Paco Sordo have teamed up to create a gem of a book here! And now I’m thrilled to welcome onto the blog, Matt Brown himself to show you a couple of magic tricks of his own! I actually tried these on my other half, and they were a success!! The first magic tricks I’ve ever been able to achieve! So, get your kids reading the book, and then wow them with a magic trick, before teaching them how to do it so they can show their friends, fun fun fun!! Wasn’t that fantastic!? Thank you so much Matt for sharing your tricky secrets with us. 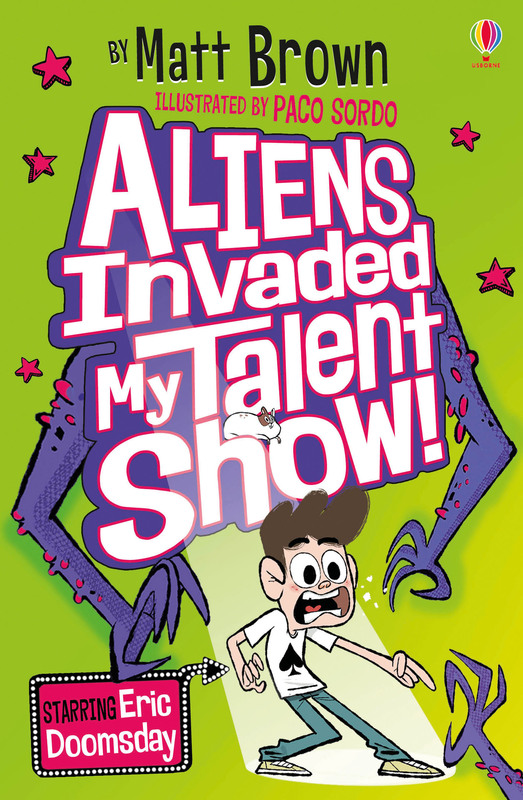 Alien’s Invaded my Talent Show is available now from all good bookshops and libraries. Don’t forget to check out the previous and future blog tour locations to see more of Matt’s guest posts and reviews! Finally, thank you for reading this rather tricksy Book Monster review.